At 56.67%, the Rams are 14th in the league when it comes to scoring in the red zone. That’s up by a little over 3% since last season. As of late, they’ve seemed to be more willing to ride with running back Todd Gurley in those situations, as his 14 touchdowns indicate. Speaking of Gurley, it was nice to see him get some breathers as Malcolm Brown got to grind out a few possessions. In general, with the Rams’ bye week still a month away, it was great to see a handful of starters getting some rest in the fourth quarter. All in all, it was luxurious day for the team, back in the California sunshine with plenty of Rams fans scattered around the lower bowl at Levi Stadium. The tight ends may never become a major part of the passing game. Entering the season it seemed conceivable that Sean McVay may go back to using his tight ends more often as a wrinkle to stay a step ahead of tape crunching defensive coordinators around the league. However, with Cooper Kupp, Robert Woods, and Brandin Cooks only improving, it seems like the Big 3 will be on the field the overwhelming majority of the time. That makes it more difficult to draw any real conclusions about the Gerald Everett selection in the 2nd Round of the 2017 draft. Is the lack of production Everett’s fault, or is he simply buried in a blizzard of talent? It is worth noting that San Francisco 49ers’ prolific tight end George Kittle was drafted a full 102 picks behind Everett that year. What would Kittle do in this Rams offense? And would Everett be capable of being more of a featured offensive weapon elsewhere? The same questions can be asked of the Rams other tight end Tyler Higbee. But really, who cares as long as the Rams offense keeps the scoreboard spinning? 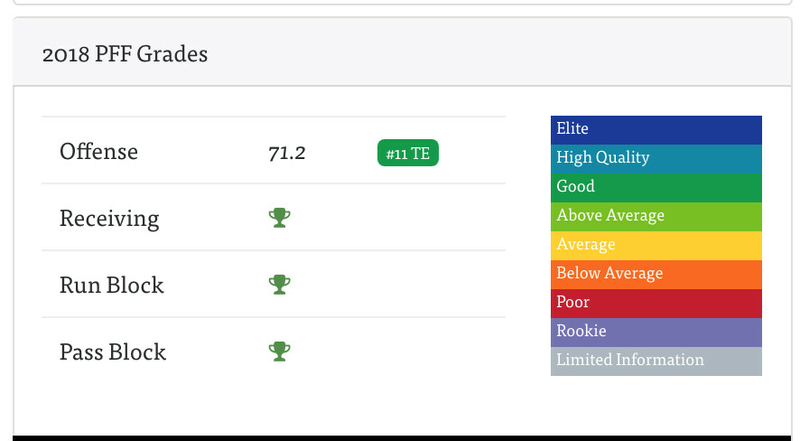 Worth noting, is that both Everett and Higbee have been graded decently by Pro Football Focus this season. The Rams can win different types of games. The offense certainly made an appearance, though it wasn’t quite the shock-and-awe type of assault that they have launched so often this season. Their final stats may have been somewhat minimized from continuously working short fields following the numerous turnovers created by their defense. The defense, who has often been treated as an afterthought behind Goff & Co. came to play on Sunday. No, Jimmy Garoppolo wasn’t out there, but the Niners are still 2nd in the league in rushing behind a strong line, and have capable weapons in Pierre Garcon, George Kittle, and Marquise Goodwin. The game turned out to be the best display of what the Rams’ pass rush is capable of that we have seen thus far in 2018. Samson Ebukam finally got home, as did Cory Littleton; and Aaron Donald’s game exceeded any possible description. Also worth note is that the Rams corners basically blanked the 49ers wide receivers, which has now happened in 4 of the Rams’ 7 games so far. Only the Vikings, Broncos, and maybe the Chargers enjoyed any success outside. With Marcus Peters getting healthier, and the eventual return of Aqib Talib, that kind of coverage should continue to be a deadly compliment to the pressure up front.